How did you get fake Antivirus Security 2013 virus on your computer? I was watching the clippers vs 76ers NBA game at 10: pm est. on ilemi.com/bz and my work computer locked up by way of FBI and is asking for 0 if my boss sees this in the morning i’m fired, we have Mcafee and Norton security tools but i guess it didn’t/doesn’t work? Antivirus Security 2013 Virus seems to be a legitimate antivirus program judging from its appearance and functions (Looks like AVASoft Professional Antivirus). In fact, it is a fake thing that released by hackers. The criminal masterminds responsible for creating and spreading viruses have one goal: make money. That is why Antivirus Security 2013 Virus is created and it is extremely sophisticated. Everyone wants to safeguard his computer from threats. Not being prepared for daily protection when a virus strikes can result in some pretty unwanted and inconvenient consequences for you. If you have tried to combat this virus but failed, the first best approach is for you to equip yourself with the knowledge you need to remove the virus manually from your computer without damaging your files and data. We focus on how to remove Antivirus Security 2013 Virus from user’s computer, first, we provide the manual removal information you can follow here to uninstall the rogue anti-spywaare. Learning how to remove malware manually can save you much time and money. Before you manage to seek for those infected files, however, you must understand the objective and the background of Antivirus Security 2013 malware first. Like many fake firewall alert viruses, Antivirus Security 2013 Virus has the ability to disable your task manager and registry editor in order to stop your real anti-virus program and prevent from scanning. This can be a big problem for many computer users, especially novices who aren’t that familiar with the tricky ways viruses act. Before you can clean out the malware, you need to repair the task manager and registry making them to be fine again. Then stop some malicious processes which occupied much space of CPU or memory. And seek for the entries generated by fake Antivirus Security 2013 software and delete them away. Note: Contact YooSecurity Online PC Expert if you are not familiar with any manual removal process and are afraid of losing any personal data or files. The manual removal will require better computer skills and knowledge during the process (Only advanced computer users are suggested to follow the guides here). You should know by now that computer viruses can be sneaky, this virus takes it to a whole new level. System security threat was detected. Viruses and/ or spyware may be damaging your system now. Prevent infection and data loss or stealing by running a free security scan. The virus has taken over your browser and stop you from accessing the internet. Taskmgr.exe is infected with Trojan-BNK.Win32.Keylogger.gen. Private data can be stolen by third parties, including credit card details and passwords. Notice: The moment you saw your computer infected with fake Antivirus Security 2013 virus malware, immediately try to reboot in Safe Mode with Networking. Working in safe mode allows you to circumvent any problems you are experiencing in normal mode so you can safely navigate around your programs and applications to find the virus and eliminate it. Step 1: If Windows Task Manager has been disabled under regular mode, please try to reboot the infected machine into Safe mode with Networking to do Step 1. 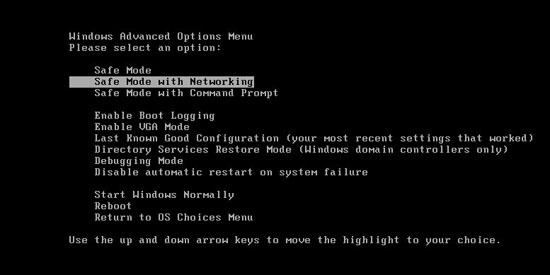 To put the computer in Safe mode with Networking, please hit F8 key repeatedly while system is booting up BUT before it’s logging in till you get advanced options on a black screen; use arrow keys to highlight Safe mode with Networking option and hit enter key to proceed system loading files into that mode. 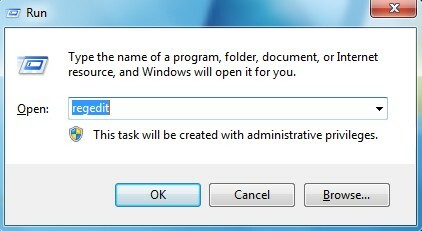 Step 2: Press Ctrl+Alt+Del at the same time to open the Windows Task Manager; go to Processes tab on top; then End processes associated with Win 7 Security Cleaner Pro or processes not belonging to system. Step 3: Open Control Panel from Start menu. 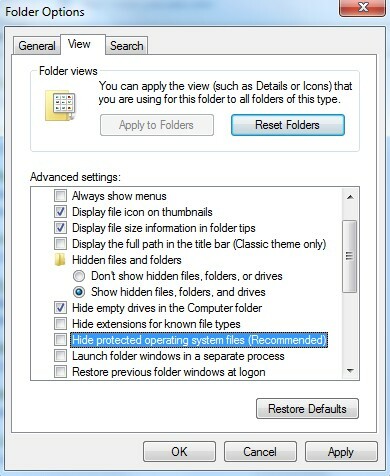 Go to Folder Options and under View tab, select Show hidden files and folders and non-select Hide protected operating system files (Recommended) then click OK. Step 4: Once you are in Safe Mode with Networking, things start to get a little technical, you will receive black screen with safe mode on the four corners and the icons are bigger than what they are in normal mode. You must locate the file associated with the Antivirus Security 2013 Virus scam and delete them from your computer at a quick time. All the files still are running in the background of your system, you can try to find them in the Processes tab of your Task Bar and stop them. Step 5: You are almost done with the manual removal of Antivirus Security 2013 Virus spyware. The last step is to look in the Registry Editor for even more entries associated with this nasty virus. You should be looking for something like this in your Registry Editor: Press Windows+R keys and then type regedit in Run box to open Registry Editor. Delete all the following or those related to the following files. Now that you have removed all files and registry entries associated with Antivirus Security 2013 Virus, you need to restart your computer in normal mode to take it effective. If everything starts up normally and programs are running smoothly, then your computer is free of virus. If the malware is still present, you still get the pop ups. But if you perform this quickly you will be successful. While some people are up to the challenge of virus manual removal, you don’t necessarily have to tackle this daunting project on your own. If the idea of trying to remove Antivirus Security 2013 Virus from your computer doesn’t sound fun to you, you can contact PC experts online for help. The YooSecurity Experts are ready to step in and help you at any point in the virus removal process. All professional staff can help you quickly fix any issues you may be contracting as a result of viruses like this one. If you need expert advice on how to save your computer after a dangerous virus removed, just a right click. Notice: Don’t have ability to locate certain files related to the virus? An incomplete removal is let to? Please contact YooSecurity Expert 24/7 online in time to save your computer from this fake Antivirus Security 2013 Virus.